Crafted from fluid mesh, sterling silver surrounds a flexible titanium centre to create a glittering, textured look. Flaunt a new dimension and subtle shine by wearing this bracelet alone, or add your personal edit of charms. 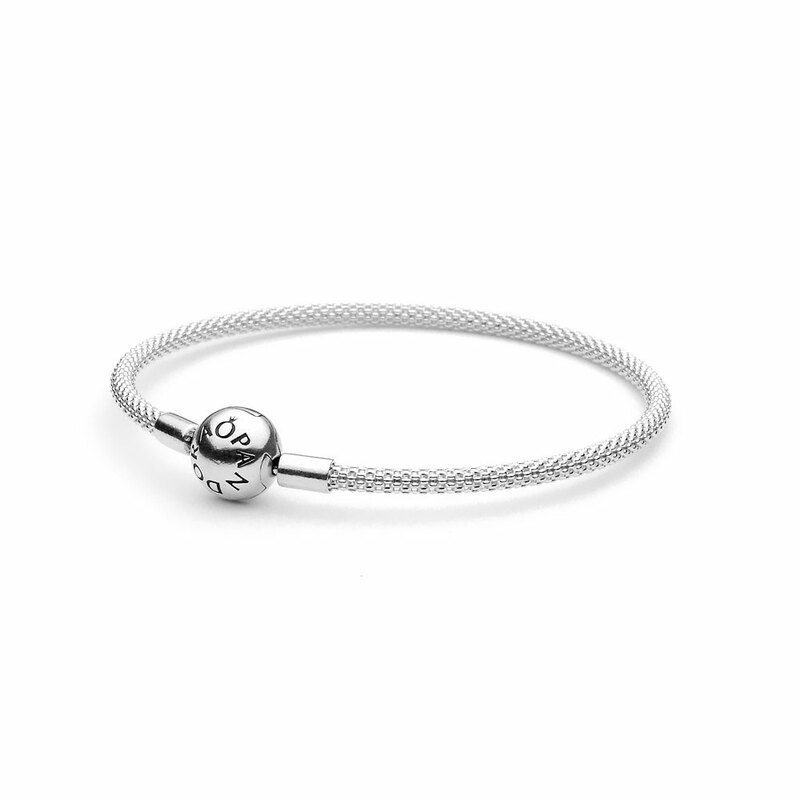 The bracelet closes with a polished sterling silver barrel clasp engraves with the PANDORA logo. Available online or in-store. MOMENTS Sterling Silver Mesh Bracelet is rated 4.4 out of 5 by 36. Rated 5 out of 5 by Je55ica from Great bracelet! Great bracelet! It looks great with/without charms. Good quality and elegant! Rated 5 out of 5 by Rinky from One beautiful piece.. This is one beautiful piece and my personal favorite from Pandora. I already got one of them and in love with design, the look of the bracelet seems to be very hollow like regular ones, but this is very light weight where you can wear it alone or with a watch or with just one rose gold geometric charm. Rated 4 out of 5 by TwinmomLG from Simple Modern Very pretty...a chic, modernistic bangle. But buy a size down than you normally would, because they’re not measured the same as a regular Pandora bracelet. The 19cm is really more like 21cm. Had to return and get the smaller one. Rated 5 out of 5 by MsTracyM from Beautiful Bangle This is a beautiful bangle! It can be worn with or without charms. Rated 5 out of 5 by Luzalex from Very pretty I received this in the mail a few days ago. I was very pleased with this purchase. This bracelet has a very delicate and pretty look. A great deal for the price.